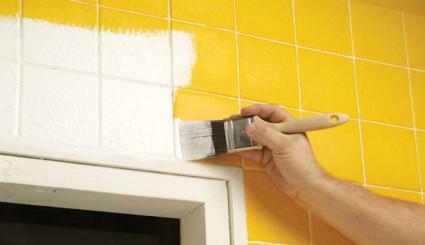 Painting ceramic tile is a way to spruce up an out-of-style or tired looking area of tile in your home. In a few simple steps, you can transform old tile into décor that looks like new, rather than go through the trouble and expense to remove it and replace it with something else. You can paint tile on the floor or the wall, as long as it's not in an area with excessive, moisture, such as next to a sink or tub, as the paint will likely peel off over time in these areas. It is a useful technique anywhere else in the house, but is an extra nice touch for a room accented with a line of decorative tile - which makes for a much quicker project than painting an entire tile floor, for example. You can paint it in a solid color, a pattern of alternating colors or you can use a stencil to create a particular pattern on each tile. 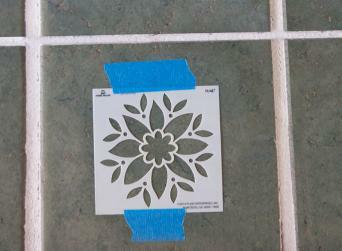 If you are artistically inclined, you can paint freehand, using the tile as a canvas. 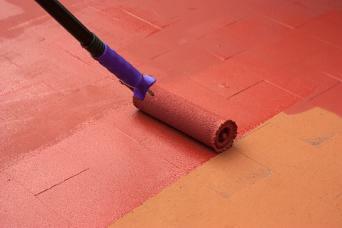 Any type of ceramic tile is fair game to be painted as long as it is properly prepared. It will need a thorough cleaning and priming to ensure that paint sticks to the surface of the tiles. Since tile typically has a bit of a sheen, avoid flat paints and go with a satin, semi-gloss or gloss paint to match the glossiness of any surrounding tile that won't be painted. Any good quality latex paint can be used - for floor applications, use a paint labeled for this purpose as it will hold up to foot traffic better. The first step is to suit up in old clothes that you don't mind being stained with paint and put on safety goggles and latex gloves. Then follow these instructions to be sure the paint adheres to the tiles and comes out looking sharp. Scrub the tile with a household cleaner/degreaser to remove dirt and grime and dry thoroughly before preceding. Scuff the tile with medium sandpaper (120 grit) to promote good adhesion of the primer and wipe off the dust with a moist cloth. Mark off the edges of the tile with masking tape to prevent getting paint where it is not wanted and tape down drop cloths where needed. Brush or roll on the primer - epoxy- or urethane-based bonding primers are preferable for tile, rather than an ordinary wall board primer. Allow the primer to dry based on what the label recommends. Brush or roll on the paint. At least two coats will be needed to ensure complete coverage - allow for the necessary drying time between coats according to the label recommendations. Wait a couple days for the paint to cure completely and then seal it with clear water-based urethane to ensure maximum longevity. Removing old, unwanted tile is a major demolition project - then you have to replace it with new flooring or wall covering. Why not work with what you have and transform dingy old tile into an artsy accent? It's a great way to upcycle and create a charming, handmade look for you home.